Sama ka chawal or Samak chawal is actually a millet called Barnyard millet that is mostly consumed during Navratri fasting. Barnyard millet cooks really fast when soaked and can be made into sama ka Jeera rice, Sama ka Upma, Sama ki Idli and Sama ka Dhokla easily. 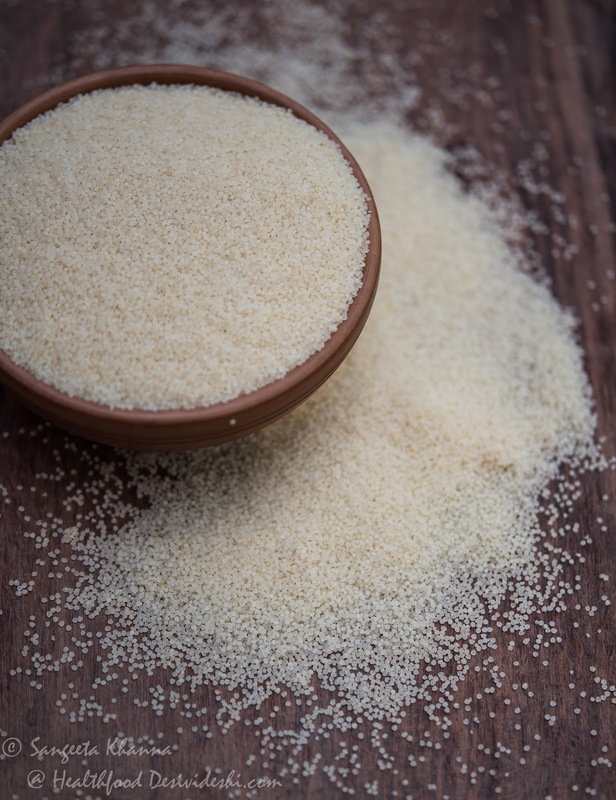 Making sama ka Dosa is also easy once you know how to use this millet. We love sama ki kheer too. Sama ki tehri or tahiri cooks quickly once you have soaked sama in the fridge. Yes it is advisable to soak sama overnight either in water or thin buttermilk and refrigerate so it can be used to cook meals quickly as the soaked sama ke chawal lasts about 3-4 days. It is particularly convenient in Navratras if you are fasting. Heat the ghee in a wide stockpot (or pan) and tip in cumin seeds. Let the cumin splutter a bit. Add the potatoes and stir and cook for 2 minutes. Now add the pureed tomatoes and all the chopped vegetables, salt and pepper. It will be better to add the other vegetables one by one according to the time they take to cook. I added carrots first and then zucchini after the potatoes and carrots were done. Toss and cook them all together. Now add the soaked sama ke chawal, mix everything well and cook covered on low flame. No need to add any additional water as there is enough water in the ingredients to get cooked. It takes about 5 minutes for this quantity to get cooked after adding the soaked sama ke chawal. Fluff up once cooked, sprinkle with chopped dhaniya patta and chopped green chilies and ginger if using. 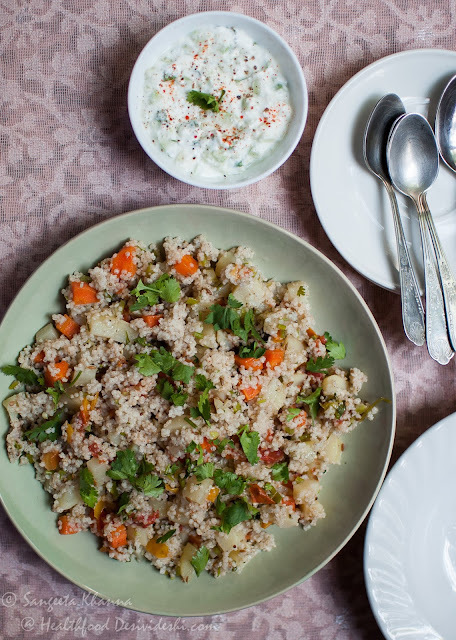 Serve with cucumber raita. Green chilies and fine julienne of ginger taste really good in this tahiri but you can avoid if you like it a little plain. You can always add some roasted nuts or paneer cubes on top to add some proteins. 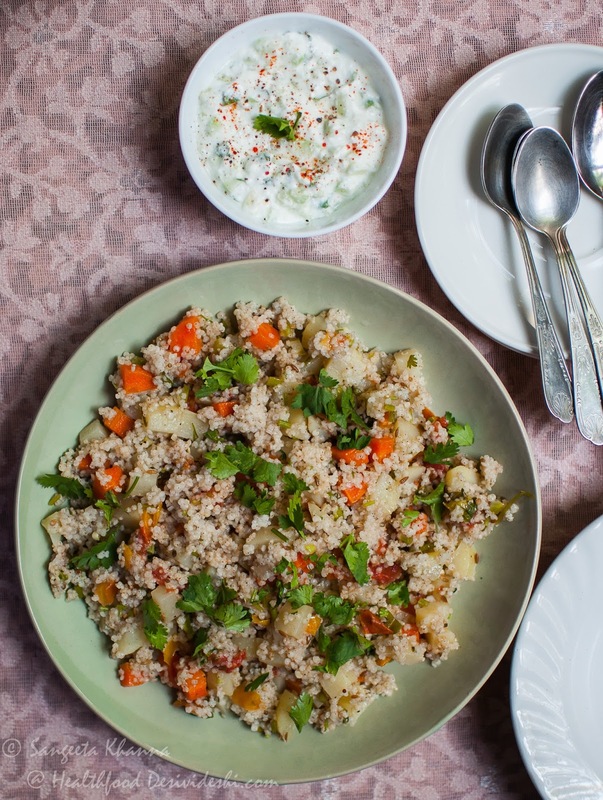 I normally like it lighter but it also depends on how hungry you are for the meal or whether you are serving this sama ke chawal ki tahiri for lunch or dinner.